This would suggest that the same may be true for Ethernet cables even when merely connecting a NAS-based music library to a router or switch. Indeed prior to embarking on this assignment I heard modest yet notable differences going from generic CAT5 to CAT7 Ethernet cable. This seemed plausible as the latter has more stringent noise rejection specs including shielding. The differences did not seem as pronounced as with USB cables but it was as obvious to my ears. 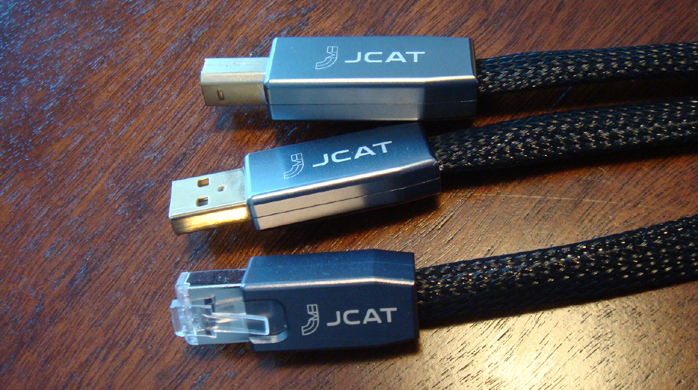 Today we have the JCAT USB and LAN cables from the creators of JPLAY music playback software. JCAT or JPLAY Computer Audio Transport is a sub-brand of JPLAY dedicated to computer audio hardware. JPLAY as reviewed previously here remains the best sounding PC-based music playback program I have come across thus far. JCAT also offer a SATA cable and USB PC card. I’m told other products are forthcoming. The JCAT LAN cable is constructed to the CAT5e standard and features Teflon-coated multi-strand multi-core silver-plated copper. Connectors are solid aluminium and easily the most robust I have seen. They were so robust that I had difficulty removing the LAN from my devices. The JCAT USB also sports Teflon-coated multi-strand multi-core silver-plated copper with solid aluminium connectors and conforms to the 90Ω USB standard. I was given a 1m run of JCAT USB, which I connected to my laptop and JKSPDIF Mk3 USB-S/PDIF converter; and two 1m runs of JCAT LAN, one of which ran from my NAS to a D-Link Gigabit network switch and the other from switch to laptop. All cables received several hundred hours of use before critical listening. Both LAN and USB cables--especially the latter--sounded closed in at first and somewhat muffled but gradually opened up over time. The biggest difference with the LAN over the generic CAT5e was better realization of instrumental and vocal timbre and greater clarity and transparency. Overall balance was considerably fuller and richer than standard Ethernet cables. The cheap stuff tended to not only obscure music but also made it sound more distant, smaller and tonally thin. Frankly I was surprised to hear any difference at all. But it was clearly audible not just to me but both my teenage sons who I frequently rope in for listening sessions. Even just replacing the Ethernet cable between PC and switch had an impact.